A trouncing. An embarrassment. A warning. A stonking win. Whichever way you try and spin it, Poto William’s 4613 vote victory in Christchurch East is a significant result that should be taken seriously. There are two lines which are being faithfully trotted out by the mouth-pieces of the right. The first is that turnout was low, so it doesn’t matter. I disagree that turnout was low. Rob Salmond analyzed the turnout at the last few by-elections, and came up with 14,000 as a par-score. Actual turn out was 13,318 – which is pretty close to that. Saturday’s turnout of 41.4% was actually higher than the last two by-elections, Ikaroa-Rawhiti (35.7%) and Botany (36.4%) – and neither of those two electorates were the most badly affected area in a natural disaster. The by-election was fought on the 2011 boundaries, but we know that 10,000 people have left the electorate, compared to the last census (2005). At the 2011 election, many of these people would have either still been living in the East, having not settled their insurance claims, or would have left the area, thinking that they would be able to move back – but stayed on the Christchurch East roll. I spent the day on Saturday based out of the Aranui hub, and each of the streets we went down had a high number of boarded-up homes. Many of the people we tried to get out and vote were very disengaged with the political process, and I’d argue that if turnout had been higher, it could have actually been much worse for National. The second claim about the turnout is even more disingenuous. Key said this morning the result was not surprising and didn’t represent a big loss to the Government. “The turnout was pretty low,” Key told Breakfast. Of course, low turn-out in an election doesn’t mean the result has a lack of legitimacy – just ask John Key. In 2008, he led National to the Beehive with 1,053,398 votes – 44.93% of those cast. In 2011, he was returned with an increased percentage of the votes – 47.31% – though National only increased their total by 5,240 votes. That was because voter turnout fell by over 5%. Key would be on pretty shaky ground if he wants to keep pushing this line of argument. A win is a win is a win. Of course it would have been better if 100% of electors had voted, but you can only count the votes that were cast, and some would argue (hey Eric!) that staying at home is just as valid as getting out to vote. No, this does represent a big loss to the government. A humiliating one. In the last two months, we’ve had our MP for Christchurch East run for mayor, win comprehensively, and bring in a new left-leaning council with her. We’ve then gone out and fought to fill her seat, and have again had our candidate elected in a landslide. Two drubbings in two months – and I’m pretty sure that if they hadn’t taken ECan out of our hands, they would have had three. I don’t know how we could send more of a signal, without setting fire to the CERA offices. I’ve been involved in the campaign for a while, and it’s been a hard, but rewarding slog. While people say that Labour was always going to win, I can honestly say that we weren’t taking anything for granted. There were two reasons to be concerned: firstly, the party vote in 2011, which Labour lost by a large margin. I’ve got no doubt that if they had put forward a better candidate, and run a more effective campaign, National could have done much better. They certainly sent a number of ministers down here – though one has to wonder about the effectiveness of sending an MP as unpopular as Gerry Brownlee out door knocking in some of the most damaged areas (imagine having Gerry turn up unannounced at your property after almost three years of unsuccessfully dealing with the government.) The other thing we were worried about was the local body results, which saw our popular local councillor Glenn Livingstone come in second in Burwood-Pegasus to David East. This risk was moderated by some smart policy announcements, especially around Kiwibuild and the New Brighton revitalization. While much of the win has been chalked up to “the Labour machine” and “the old warhorse Jim Anderton”, it should be noted that it wasn’t just a case of flicking the ignition and getting the machine purring. All through the campaign, we were struggling to get as many volunteers as we wanted. After the local body elections (which also overlapped the by-election campaign for about 6 weeks), the leadership election and the annual conference, Labour members in Christchurch were pretty exhausted. You can also add to that the general issues that people have in town at the moment, and get a better picture about just hard people worked to pull this off. Congratulations have to go to a number of people. David Cunliffe made a big effort in this campaign, which has pretty much covered the entire period of his leadership. His first public appearance after being elected leader was at Poto’s selection meeting, and he’s been down often since that. 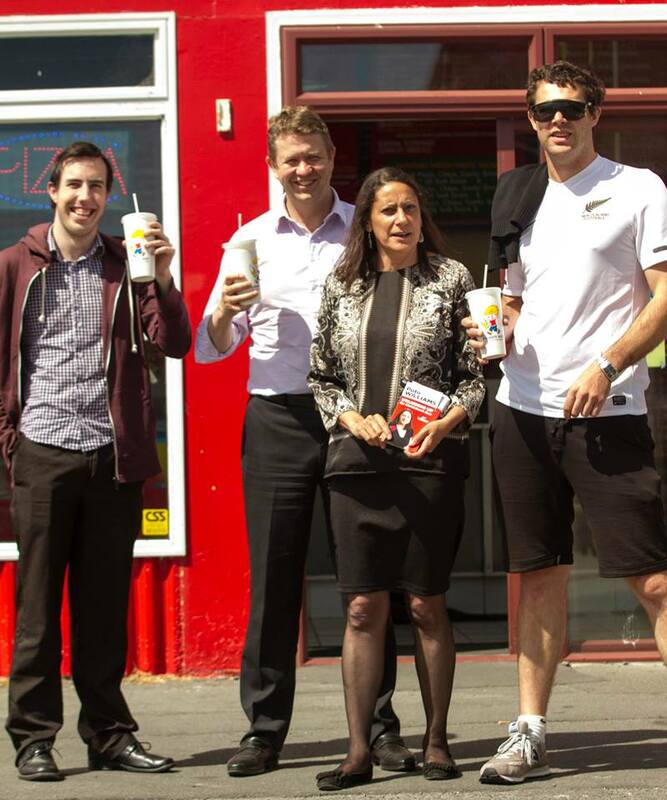 The local Labour MPs – many of whom supported Grant Robertson in the leadership contest – have supported David and Poto through the campaign, especially Megan Woods, who has done a huge amount to help with street corner meetings and policy announcements. The local Christchurch East LEC did a phenomenal job. Jim Anderton was a great leader, but much of the credit should also go to campaign dogs body, Hayden Munro, who was everywhere, all of the time. I think he’ll be looking forward to a sleep. Credit must also go to Poto. The party made a bold choice, and I think they will be rewarded with a strong MP. Poto hit the ground running, and worked incredibly hard to meet as many potential electors as she possibly could. She did 100 street corner meetings, even though she had lost her voice after about the first 10. This was a resounding win for Labour, and hopefully it will convince any of the doubters within the Party that to win back Christchurch, we need to outline a strong plan for the city. This, by definition, means “politicizing” the earthquakes. A clearly articulated vision, which places people at the centre of recovery, will be key to not just winning back Christchurch Central, but also the all-important party vote across the city.